We reach the Navajo Bridge built in 1928, four hundred and seventy feet above the Colorado River, the first bridge across the Grand Canyon. It remained the only bridge until the late 1960’s, when a new one was built just next to it to carry the increased vehicle traffic. The original then became designated for foot traffic only. We drive along the Vermillion Cliffs to the North Rim of the Grand Canyon through scrubby desert and Ponderosa pine forest. The bark is the color of cinnamon and smells faintly of vanilla. 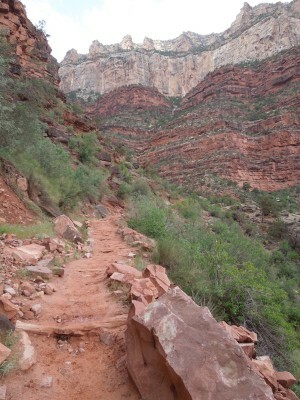 A practice hike of five miles along the northeastern-most rim of the Canyon warms up our muscles for what is to come. The quaking aspens are just leafing out, citronelle and ethereal. a drop in elevation of nearly six thousand feet. 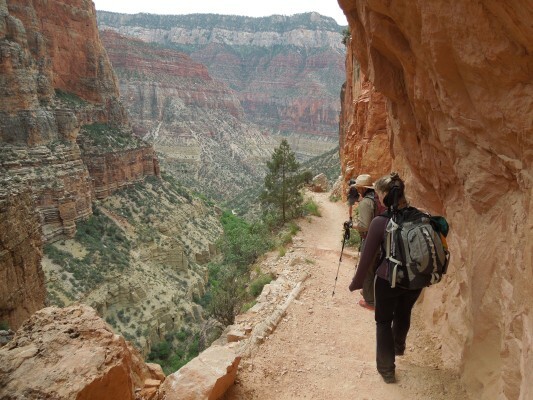 We hike at comparative break-neck speed through colorful layers of sedimentary rock formed over many millions of years. We arrive at our destination ten and a half hours later. I am foot-sore and weary and yet thrilled that I could experience one of the worlds great hikes. 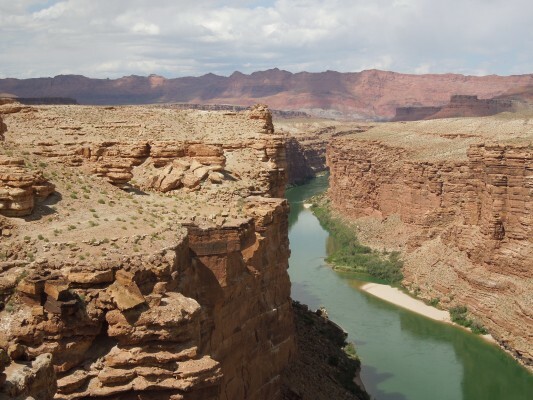 During our “rest day” at Phantom Ranch, we hike to an overlook one thousand feet above the Colorado, a magnificent viewpoint to the mighty River far below. 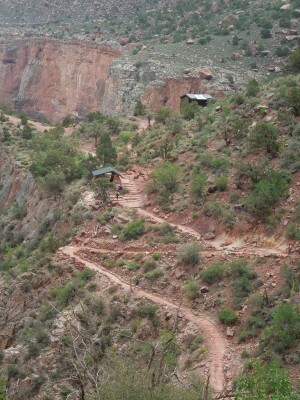 Two bridges close to Phantom Ranch cross the Colorado, one for the mule trains that carry supplies, the other for hikers. We cross both, experiencing the River from each side. Later, we put on water shoes and hike in a bracingly cold tributary of Bright Angel Creek to a cave where delicate angel hair ferns grow underneath a waterfall. 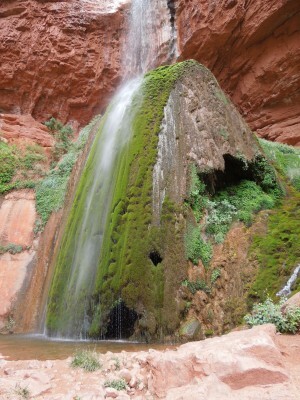 We are told the normal temperature in the Canyon in May is one hundred degrees. Instead, it is in the fifties with thunderstorms. 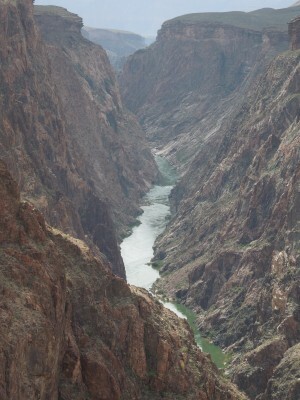 As our guide told us, what goes down the Canyon must come up. 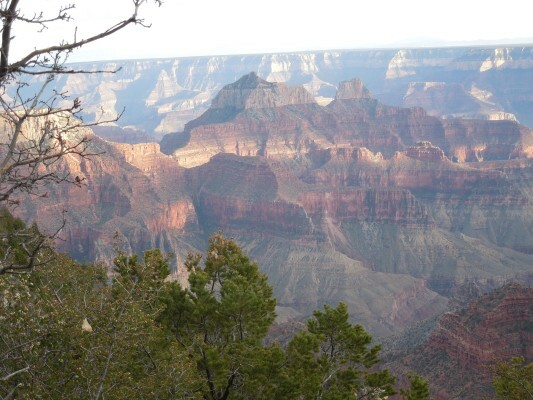 So once again, we get a 4:30 am wake-up call and set out at 5:45 on the Bright Angel Trail to the South Rim of the Grand Canyon, a ten-mile hike from Phantom Ranch. The elevation gain is nearly five thousand feet. The weather is cool and cloudy. As we ascend via steep switchbacks, the air becomes colder and heavy with moisture, a weak sun occasionally peaking through the clouds. By the time we reach mile eight, it is pouring and the temperature is fifty-one degrees! We arrive at the South Rim seven hours after we began, soaking wet, and it is forty-six degrees! Not exactly as predicted. And yet I can’t imagine having done this hike under a scorching hundred-degree sun. How bountiful our country is in stunning natural beauty. I am eager to explore more of it.